When it comes to killing blackberry bushes (Rubus spp. ), the task can be tough. Blackberries spread through long rhizomes, a type of root structure, making it difficult to kill and allowing some species to become weedy. You can eradicate blackberries from your yard with organic methods or chemical methods, whether they are a wild species or a cultivated variety. Triclopyr is a herbicide that's effective in killing blackberry bushes on its own or when combined with mowing. When using triclopyr by itself, the best time to treat is midsummer on a calm day when the air temperature is above 80 degrees Fahrenheit. Choose a ready-to-use product that doesn't require mixing and spray the leaves until they are completely coated, but not dripping. To combine it with mowing, mow the blackberry bushes in the fall; then apply triclopyr during the next growing season in late summer. Apply it several weeks before the bushes enter dormancy to give the herbicide time to reach the roots and kill the bush. When using triclopyr, wear long pants and long sleeves, and follow all instructions on the label. Apply glyphosate herbicide in late summer to early fall, and you'll see the blackberry bushes die out before the first frost. It comes in ready-to-use formulas that don't require mixing. To use, thoroughly spray the leaves and canes until they are covered but not dripping. To increase killing power, wait about 50 days; then mow the bushes. This directs more herbicide to the root system. Don't treat bushes stressed from drought, as this reduces the glyphosate's ability to travel to the roots. Glyphosate products come in different concentrations, and you should choose one that states on the label that it kills blackberries. When using glyphosate, wear long pants and long sleeves, and follow all instructions on the label. Keep children and pets out of the area until the chemical has dried. If you prefer an organic approach to eradicating blackberries, rototilling them repeatedly will eventually work. For upright varieties, cut away the canes before rototilling the remaining roots. After the first tilling, pick up any root material that has been brought to the surface, along with all canes you pruned away. Wear heavy gloves to protect your hands. Dispose of the roots and canes through your trash or garden waste service. Continue tilling the ground every few weeks until you no longer see new sprouts. 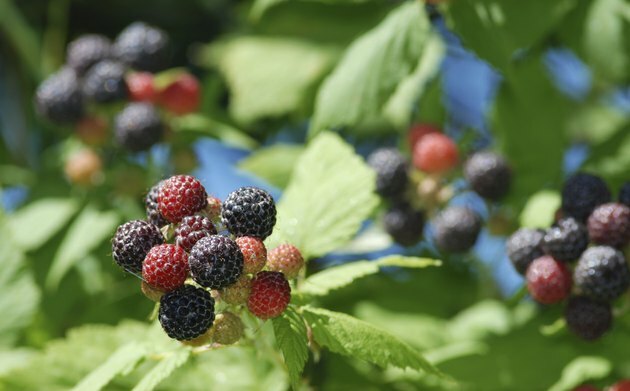 Planting grass or another perennial with dense foliage in the area provides shade to help prevent blackberry seeds from sprouting. Blackberries grow as a perennial in U.S. Department of Agriculture plant hardiness zones 6 through 8. Mowing the bushest as a control measure keeps them in check, but won't kill them. Unless your mower is capable of removing all leaves from the plant, it can still photosynthesize to supply food to the roots. Mowing can be somewhat effective if done while the bushes are blooming, preventing new seeds from forming and reseeding the plant, and all leaves are removed from the bush. The roots starve and die without leaves for photosynthesis, but keeping up with newly forming leaves can be a battle. Couple mowing with herbicide application or tilling for more effective results than mowing alone.